The benefits to all residents in renewed property values and increased tax assessment make it a worthwhile investment. A struggling core is a drain to all Hamiltonians. I was on King Street in the International Village this week waiting for a friend and had a chance to observe how the street functions. After five or ten minutes, it was abundantly apparent once again that King literally has almost everything going for it - except for the annoying, life-sucking thoroughfare and huge craters of surface parking lots to its north and south cutting it off from the dense residential neighbourhoods there. Even with only two traffic lanes, cars roared through in a succession of mini-clumps before the street was empty for a minute or two. It's basically like Main Street, but on a smaller scale and just as hostile to any form of vibrant urban life. I stumbled upon this article outlining some of the main factors that allow for a vibrant 'Main Street'. There is nothing here that we don't already know. Sadly, some people are still willing to sacrifice business investment and vibrancy along Main and King if it means a slightly faster drive through the city. Most glaring to me is the fact that item #1 is completely laughable when talking about downtown Hamilton's streets. We don't do #1 or #4 well at all, which is making #3 - viable local businesses - impossible. Look at Main or King during lunch or dinner time, and then compare it to Queen or King in Toronto at those same time periods next time you're there. We used to have that. And we still can. The pedestrianization and ravamp of Gore Park is a great step to adding a better natural experience downtown. A few block segment of empty lots converted to a linear, urban park would also be a great initiative. Residential proposals at the Royal Connaught, Gore Park, Lister Block and 150 Main West can begin to add much needed residents living right on the King Street corridor. Main Street does not work. Every urban expert who has visited in the past 15 years has proclaimed this obvious fact loud and clear. 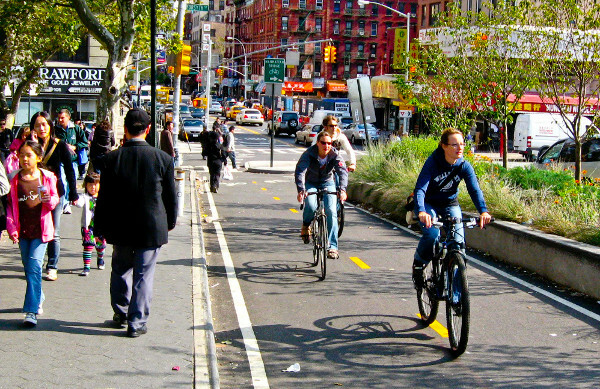 New York City recently took similar five-lane streets and created a safer experience for pedestrians and cyclists and have seen business improve as people feel more comfortable being there. There is no reason we can't do the same thing on Main Street. Not only do trees enhance the look and feel of downtown streets, having them 'inside' the bike lanes helps to give wide streets a narrower, safer feel. 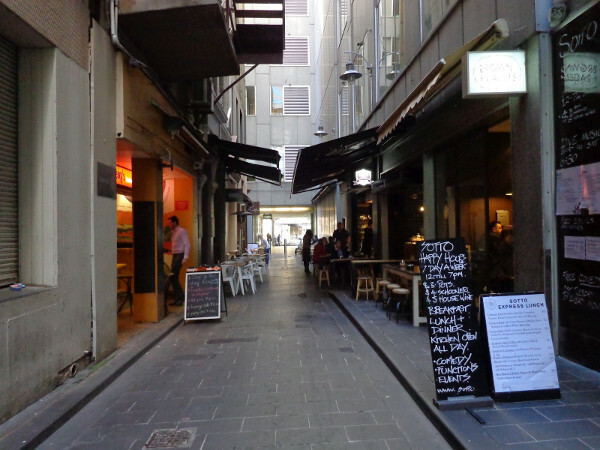 Cities around the world are bringing pedestrian life and retail into narrow back-alleys instead of allowing these urban spaces to simply be for parking or garbage. Small-scale cafes with patios, public art walks and linear gardens can all open up new opportunities for a superior pedestrian experience downtown. Hamilton has some perfect candidates for such ideas in alleyways off James North, the long alley running west/east from James on the north side of King and behind the west side of James South from Bold to Duke. Alleys in residential neighbourhoods downtown can become green linear connections providing great cycling, walking and running routes through urban neighbourhoods. If Hamilton is to compete with other Canadian cities over the next decade, we must take the revival of our oldest urban neighbourhoods seriously. The benefits to all city residents in renewed property values and increased tax assessment make it a worthwhile investment. A struggling city core is a drain to all Hamiltonians. We know what to do. Enough talk and hand-wringing. Let's do it. Best answer is no cut off all Vehicular traffic (except deliveries at specified hours) from Wellington to James. Underpass at John. No other N/S traffic, Make it an Island. Then build some more condos. Calgary tried this with 8th Avenue SW and it didn't work very well. The street became a ghost-town and people actively avoided the street, with the exception of during lunch hour. They eventually opened up the street to a very small amount of one-way traffic during select hours and that helped bring people back to the street, as cabs and purposeful traffic could access the businesses there. I'm not saying the pedestrian only idea couldn't work, but for it to be the 'best answer' you'd have to build an awful lot of condos. With all due respect, if you're unhappy with the design of International Village and think those two lanes are "life sucking", perhaps an urban environment is not for you and you'd be happier in a small retirement village somewhere where everyone drives golf carts. I'm not sure what you think King and Queen St in Toronto have that we "used to have", or when we use to have it just as I'm confused how a steady stream of cars provides a better "pedestrian experience" than clumps of cars followed by empty streets. It's the most "complete" street in Hamilton so I'm not sure what fantasy you expect to have happen with Main. What ever it is, I'd suggest you move now because you're going to be disappointed with that as well. We, the board of management of International Village BIA, feel that the existing system of one-way streets is detrimental to the success of our BIA and of Hamilton as a whole. In spite of tremendous success stories in areas that have returned to two-way traffic, there is still some reluctance to address the next logical step: the conversion of Main and King Streets to two-way traffic. We feel this is an idea whose time has come; to allow the city's core to break free of this failed experiment of a bygone era. The perpetuation of one-way streets has bred a culture in this city where the needs of the car outweigh those of the pedestrian, the cyclist and the community. Where businesses are allowed, even encouraged to fail in favour of high-speed traffic and timed lights. Where the safety of our citizens and our children are of lesser import than the perceived right of motorists to maintain highway speeds at all times. We have allowed the economic and cultural destiny of the city's core to be subverted to serve the interests of those who want nothing from our downtown but to pass through it, and it is time for this to end. The notion that turning every major artery on our roadways into a de facto highway would provide a fast-track to prosperity must have once been an appealing piece of "common sense". Viewed objectively after decades of application, however, the idea can only be considered to have failed utterly, here and elsewhere. In the process of chasing that fantasy, we have moved away from the walkable city of neighborhoods that makes for a vital, prosperous urban core. There is no greater obstacle to the success of businesses within our core, and no single issue that could be fixed more easily. We are thrilled to see this issue being discussed with renewed vigor and passion and are filled with hope that this discussion may help to foster a transformation in our community of which we may all be justly proud. The IV BIA thinks King Street is "soul sucking"? That's funny! I thought it was "an urban eclectic village complete with destination food retailers and food services as well as businesses that appeal to the growing local residential population nearby." You'll have to tell Denninger's and the Black Forest Inn that they're not viable businesses. I'm sure they'll be disappointed. I've only just discovered Stax Chicken and Waffles! I'm going to be so sad when they close because the cars only go one way and that makes the area "hostile to any form of vibrant urban life." I think the quoted release is pretty nervy considering how much money has been poured into their area in the past 15 years and how much it has uplifted the area. Common sense is to count your blessings and don't get greedy. Or perhaps they're jealous of the so much more successful two way BIA's such as Ottawa Street or Concession. I stand behind my statement. If you think International Village is "hostile to any form of vibrant urban life" and "soul sucking" you should ask yourself why you're still living in a city that you hate. Common sense is to count your blessings and don't get greedy. Yeah, the folks in International Village are just drowning in blessings. And anyway, what would 124 small business owners in an urban environment know about what small business in an urban environment needs to thrive? Many of us spent a lot of money on new store fronts. It was futile. Our windows are no good nowadays, people have no time to stop and look. Nobody comes from the west end of the city any more. We would like to see King Street two-way once more. Two-way streets will help create a place where businesses and families will want to invest and live downtown. It will make it easier for people to find you, get to you, see you. But what does he know? Like the people pouring their hearts into small businesses in the IV, he should probably just count his blessings too. Never mind the research that retail business does much better on two-way streets than one-way streets. Never mind the research that high traffic volumes are bad for quality of life. After all, what is the mere empirical evidence from cities across North America and around the world when placed against screencarp's implacable resolve that moving high volumes of automobile traffic through the city as fast as possible is more important than safe, economically viable urban neighbourhoods? you should ask yourself why you're still living in a city that you hate. Stop doing this. Just stop. People are allowed to become civically engaged and advocate to make their communities better. People are allowed to want to create an environment that is safer and healthier and meets more of their social and economic needs. That doesn't make them "greedy". What you're doing here is telling the people you want to drive past at high speed that they should just move if they don't like it. That's a ghastly expression of naked self-interest. Is that really the kind of person you want to be? Yeah, the folks in International Village are just drowning in blessings. For the amount of public money invested in the area, yes they are. International Village today looks completely different than it did in the '90's when it was four lanes and few stop lights. Traffic has been calmed, lights slowed to the point traffic does not "roar" through the area anymore. No one is driving through International Village at high speeds, it's impossible even in light traffic because the lights won't let you. Since you like history, a lot of folks who poured their hearts into their small businesses lost everything because the endless street improvements disrupted things so much they could never recover. You would happily throw them back into that mess simply because you want half of the cars to travel the other direction. Stop doing this. Just stop. Sorry but no. I'm tired of the Hamilton bashing that goes on on this site. Civic engagement is one thing, but seeing IV as "soul sucking" and "hostile to any form of vibrant urban life" simply because the cars only go one way is obviously looking at it through a cracked lens. The only "civic engagement" you seem want is that which agrees with your ideology. If you hate Hamilton so much, move. Stop bringing those of us who love it down. Stop calling us "trolls" because we like it here. Stop disparaging the great strides we've made in the core because it doesn't fit into your narrow view. Hamilton is the way it is because too many people only care about themselves and nothing else. They are happy to pay sky-high taxes instead of urging city hall to foster a business friendly climate, and revitalization of the lower city. There's no shortage of selfishness, entitlement and zero vision in this town. You've just described so many articles on this site. I agree there's no shortage of selfishness, entitlement and zero vision around here. Wow you must be a serious masochist to even sustain the muscle power in your hands to manage to type what you do. Before the BIA wasted their time with that press release, someone should have told them that ScreenCarp has already decided how King and Main should function. Should that same person tell them that you've probably already decided as well? nope. I didn't. That's why I rely on the braintrust that is the regular contributors here to inform me of things. Thanks! You're the best! Lots of boring reading material to help me get to sleep at night. Actually, not that it's boring...just mostly a repeat of previous articles...so gets a bit monotonous. I don't get it, you want users of this site to help you with information, and then when it's provided you reject it because it's too boring? And how can things simultaneously be repetitive to you, if you claim not to know them and want someone to explain it all to you? I hope you're not really a traffic engineer. A little skeptical on that one. I have NO doubt he/she is a traffic engineer. Zero doubt. So sorry to bore you with repetitive articles about vulnerable residents getting injured and killed in preventable collisions due to our dangerous and unhealthy transportation network, while other cities make evidence-based decisions to transform their streets and reap the many benefits of increased safety, improved health and restored economic vitality. Believe me, we really don't enjoy repeating ourselves. Then again, you might prefer this article, which should be right up your alley. Just assume the author is being serious. Do you ever link to anything outside of this site? "Here are some more things I've said that prove my point". Umm...no, it doesn't work that way. Each of those articles has links to original sources. The articles provide the context. A long list of original sources is not helpful by itself, as you surely understand. It DOES work that way, at least in science and the evidence-based research world if not in yours. Your first duty is to read the articles, and the original sources. If you don't feel like it, don't expect others to re-do the work for you each time the topic is raised again. It does get extremely tedious to have to repeat the same arguments and provide the same evidence over and over to those who can't bother to read what has already been written and archived. That's why journals provide access to back issues, and that is what is done here on RTH! Aren't you the same guy who recently claimed to be a traffic engineer? For everyone's sake I sure hope you're close to retirement. Naw, I'll be around for a while...trying to find the right balance for all road users. Just to reiterate....I'm not against complete streets, better cycling facilities, pedestrian crossing improvements, etc... I'm just saying that it's about striking the right balance. What we have isn't perfect...don't kid yourself into thinking that I think that way...but also a 180 shift might be a bit far...at least for now. Changing the modal split would be great, but it takes time...and unfortunately it's not a "if you build it, they will come" type of situation (at least in my opinion). There will always be cars...like it or not...and it's incumbent that those road users have efficient movements through corridors as well. A 180 degree shift might imply banning cars or something. That's not what we're asking for. Just slightly smarter road design. Any change at all is seen as way too drastic, and treated way overblown. Who said anything about eliminating cars durand(not likely)er? Oh no...I assure you I live in Durand. Why don't you reveal yourself? You might be my neighbour? Have you thought about helping out with DNA? Yes, I'm a member. I sat near you at the AGM last fall at City Hall as you complained about everything. One correction: I certainly didn't "complain about everything" (maybe you are confusing me with someone else). In response to the policeman's suggestion that the DNA could look into a 30km/h pilot in the Durand, I reminded him that Council had imposed a 5-year moratorium on other 30km/h zones when they approved the one in the North End. Why don't you just tell me who you are instead of hiding behind a pseudonym? If you are really interested in contributing to the discussion (at least 142 comments on RTH alone), you should consider participating more actively in the DNA. Especially if you actually are a traffic engineer and are opposed to the DNA's traffic policies and projects which have been consistent for 40 years! If you are shy about doing this publicly, you can email me or the DNA president. So you're reiterating that you don't know what you're talking about and haven't a clue what "striking the right balance" means because if you did you'd realize that advocating for these modest changes (as many do on RTH) is nowhere near a 180° shift, it's barely a 15° one. You're just another concern troll that doesn't want to give an inch. I love the term troll..it's so endearing. Just because I don't agree with everything that is stated here doesn't mean i'm a troll that doesn't want to give an inch. It means I'd like to have a discussion about these items. But every article on here in posted in a "holier than though" tone, and everyone that disagrees is treated like an outcast. Be reasonable people! There is a difference between a run of the mill "troll" and a "concern troll", which you obviously are. You mask (rather poorly) the fact that you don't want any progress made in moving away from the status quo (even a tiny amount) under a guise of reasoned debate, but you offer anything but. The 180° comment is proof positive of that. Are you actually a qualified (and possibly even employed) traffic engineer as you have claimed? The DNA could use your advice, since you clearly disagree with everything they've done for the past 40 years regarding the streets! Especially as you seem so keen on criticizing and giving advice. Where's the proof that I disagree with everything they've done in the past 40 years?!?!?! From Chapter 10 of 'Durand: a neighbourhood reclaimed' which details the efforts of the DNA, starting in 1976 to calm traffic, convert the streets to two-way and reduce the speed limit to 20mph! In 1976 residents of the Durand and adjacent Kirkendall neighbourhoods made a joint plea to the City: "We are all feeling the increasing pressure of heavy unremitting through traffic with the noise, pollution and safety problems that come with it ... We would like the City to assist us in carrying out a careful review of the traffic and transportation policies in our neighbourhoods". The request was ignored. [Colin Vaughn, a Toronto alderman] provided the Association's annual meeting with a list of deterrents to excessive traffic: narrowing the roadway, installing stop signs at most intersections, diverting traffic by turning most of the residential streets into a maze and positioning obstacles such as speed bumps. His most radical suggestion was for removal of one-way streets. The Durand Neighbourhood Association proposed interrupting one particularly favoured morning rush hour route by prohibiting motorists descending the Escarpment from filtering through the neighbourhood's residential streets. This request was repeatedly rejected, as was a suggestion to impose a 20-miles-an-hour speed limit on most streets within Durand. The Traffic Department's obstinate defence of the status quo bred increasing resentment. Nearly every change recommended by citizens, however, minor seemed to spawn an avalanche of reasons why they could not be implemented. And so it continues: a forty year fight for safe streets in Durand. I didn't say "everything" I said everything regarding the streets. Because the DNA has consistently supported traffic calming and two-way conversion, and now complete streets for its whole existence. Have a look at the 2002 Traffic Study. Traffic calming has always been a defining theme of the DNA, along with heritage preservation and promoting good urban design and public involvement in urban planning decisions. Perhaps you have not fully represented your views, but the proof is in every comment you make opposed to these sorts of changes, certainly on minor arterials in the Durand (Bay, Herkimer, Charlton). In particular, you support the current high speeds on these roads, which the DNA does not. Your views are completely opposed to those of the DNA, and I've never heard anyone publicly make this case at any of the dozens of traffic meetings the DNA has hosted or attended in the last 14 years. Really? Some people want to close Herkimer Steet and place bollards in the middle of it? That's not a 180º shift? It is possible that we will soon know just how many people who actually live there favour opening up Herkimer Street by eliminating rat-running. This is because they may be voting for it on the Participatory Budget ballot. I write this because I am a Budget Delegate for Ward 2, and this proposal is one of the proposals that has gone through the community consultation process and is now (sigh...) in the hands of City staff. What other arterial should people use to to James Mountain Road? You bought your house on an arterial road...get over it! People should use Herkimer. There are plenty of ways to do so. These include walking, cycling and public transportation. It is just simply not necessary to launch a lethal poison attack upon a residential neighbourhood. Lethal poisons to which children and the elderly are particularly vulnerable. Arterials can be two way. They've tried that someplace called "everywhere else". Besides, we have King/Main/Cannon to carry huge bulk amounts of traffic, we don't need to screw up local residential neighbourhood streets too. LRT does not affect Main, only King. And we will still have 3 live lanes of Cannon, which is why they put it on King - so there's still one massive eastbound corridor and one massive westbound corridor. King is 5 lanes west of Locke. LRT takes two lanes. That means the Eastbound Cannon->Queen->King corridor will still be 3 lanes for most of its length, with the 2-lane break from Cannon/Queen to King/Locke. That's still solid 1-way throughput. And besides, an arterial does not cease to be an arterial when it becomes two-way. Herkimer and Charlton would function just fine as two-way. That would slightly calm down traffic and make it more human-friendly, and would still allow drivers plenty of freedom there... more even. There may be some super-narrow areas of Charlton that are worth keeping 1-way for street-side parking, but 1-way should be the exception and not the rule. Don't be obtuse: we're talking about this article, not the suggestions of one commenter. You're not against complete streets, you just speak out against every step taken to make our streets a bit more complete. I'm starting to understand why nothing ever changes in this city. The most complete street in Hamilton? Hilarious! It's so complete that cyclists are told to dismount and take an alternate route. Wait a minute, I've felt that tingle of condescension before. Oh God, is mytownstoneyhallscreek back with a new nickname? I would be happy if the rest of council just let those wards that want to start making changes (e.g. 1 and 2) get on with it, for example by using the area weighting money, instead of debating the changes to death and worrying about how their residents will react to changes in other wards. Council doesn't tend to micro-manage urban design changes in Stoney Creek, Winona or Ancaster. They should give local residents and businesses the benefit of the doubt that they might actually know what will work in their own neighbourhoods! Besides, "carping on" is part of building change: look at the restart of heritage designations by council and Cannon street bike lane. And many of the people contributing to this site are also working on the ground through neighbourhood associations, with their councillor and with participatory budgeting to drive changes at street level. One small quibble: A better use for back alleys may be for deliveries only, with the street on which the businesses front being car-free. That was the highly successful formula for making Yonge Street in Toronto car-free in the 1970's. As well as, of course, a gazillion highly successful car-free streets in Japan and Europe today. Allowing cut-through "rat-running" car traffic through downtown is profoundly disfunctional and highly dangerous. As we have seen from the Medical Officer of Health data recently posted on RTH, 93 people are killed in Hamilton every year because they are poisoned by the lethal air pollution put out by car drivers. An additional 395 people in Hamilton are poisoned by car drivers every year and injured so seriously they have to be hospitalized. Mode shift away from car driving by making walking, cycling and public transit the fastest, easiest and most convenient way of travelling from A to B eliminates these lethal poisons and saves lives, injuries, the suffering of sick children and serious health-care costs. Due to its high concentration of people, downtown Hamilton should be a high priority area for eliminating cancer poisoning of its population by effective mode shift policies. Take a virtual tour down this street in St. Remy, France. International Village could look something like that! I don't see one-way streets as being synonymous with fast and dangerous streets. I see one-way streets with synchronized lights that force drivers to go at high speeds to avoid a red light as the problem. Is the problem with one-way streets really the fact that all cars are moving in the same direction, or is the push for two-way streets based on the observation that two-way streets are less efficient for cars, and therefore speeds are lowered due to gridlock? If it's calmer traffic we want, can't we have efficient, one-way streets with low speed limits? As an occasional driver, I'd rather cruise slowly and avoid red lights altogether than have to deal with stop-and-go, two-way traffic. As an occasional pedestrian, I find it convenient to cross a street mid-block when there's regular breaks in traffic and I don't have to worry about cars coming from two directions. I had dinner at a restaurant on King St between Caroline and Hess yesterday during rush hour. We had a window seat. The lull in traffic between red lights was a nice, peaceful break from the roar of speeding cars that was there the rest of the time. I'm glad the bus lane added a buffer. If the synchronization of the lights was slowed down to only allow a speed of 30 or 40km/h, the roar would be diminished, there would not be the same frustrating gridlock that you get with two-way traffic (ie James and John near St. Joe's), and there would still be the peaceful lull which is a safe time to Jaywalk. If cars are riding a wave of green lights, they're not idling much which is better for fuel efficiency and air quality too. Am I missing something here? Maybe someone could write an article (or point me to one already written) that explains how, if at all, the benefit of two-way streets goes beyond just slower traffic (which one-way streets can accomplish along with other benefits that can't be had with two-way streets). It's important to note that merely adjusting the synchronized traffic lights isn't a solution. Drivers tend to drive at a speed that feels comfortable, and a street where the comfort speed is mismatched with the light synchronization will tend to result in repeated braking, acceleration and driver aggression. Public health research using Hamilton traffic data has found that one-way streets are 2.5 times as dangerous for children as two-way streets. Drivers on one-way street networks need to make more turning movements to reach a destination (overshoot, turn onto a cross street, turn again onto destination street and backtrack). Automobile turning movements are the most dangerous situations for pedestrians, so one-way networks increase the risk of pedestrian collisions. One-way street networks that funnel traffic tend to reduce drivers' situational awareness, increasing the risk that they won't bea ble to avoid hitting an unexpected pedestrian "in the way". For drivers, it is much harder to reach a destination on a one-way street facing the wrong way. For example, if you're coming from the west, it's difficult to reach a destination on King Street. A one-way street is by definition only half as usable as a two-way street, since it fails to accommodate the movement of half its potential users. One-way networks are far less resilient and flexible than two-way streets in the case of a collision or other closure. When Cannon and James was closed for a water main break, drivers were able to go one block north to Wilson/York to bypass the closure; that would not have been possible if the street hadn't been converted to two-way. One-way networks with timed lights waste public space by grouping clumps of automobiles together, alternating with stretches of complete emptiness. The evidence indicates that retail business does better on two-way streets than one-way streets. One reason is that on a one-way street, far fewer people are able to see a given storefront. Cities that convert their one-way city centre networks back to two-way generally experience significant improvements in local economic health with increased sales and new investments. How many children have been killed in Hamilton due to one way streets? I don't mean to be snide but I was taught that a million times zero is zero. Using injury data from the City of Hamilton Traffic Department, the study found that the overall injury rate was 2.5 times higher on one-way streets than two-way streets, consistent across all age groups from 0 to 14 years of age. Not only was the injury rate higher, but also the severity of injury varied across the street types. Listed are some before/after safety studies indicating one-way streets are safer for pedestrians than two-way streets. PORTLAND, OR (1949): Portland converted most of their downtown two-way streets to one-way streets in the late 1940’s. After conversion, vehicle accidents decreased from 6,127 to 3,361 (-45.1%). The number of pedestrian accidents decreased from 237 to 126 (-46.8%). Volume of traffic in downtown increased from 12,734 to 16,708 vehicles (+31.2%) and average speeds increased from 7.9 mph to 14.2 mph (+79.7%). CINCINNATI, OH (1975): Cincinatti converted Vine Street between Central Parkway and Mc Micken Ave. from two-way operation to one-way in 1975. After conversion, vehicle accidents decreased from 212 to 128 (-39.6%). The number of pedestrian accidents decreased from 16.6 to 13 (-21.7%). Volume of traffic increased from 24,520 to 28,025 (+14.3%). NEW YORK CITY, NY (2008): The Park Avenue Tunnel at 33rd Street was one of the top pedestrian crash locations in the city from 1996-2007, averaging 12 pedestrian crashes per year. The city converted the tunnel to one-way operation in 2008 and the intersection saw a dramatic drop in both pedestrian injury crashes (100%) and all injury crashes (74%). DENVER, CO (1986): Denver converted several one-way couplets to two-way streets in 1986. After conversion, the vehicle accident rates at intersections increased 37.6% while the mid-block accident rate increased 80.5%. CINCINNATI, OH (1999): Cincinatti converted Vine Street to two-way operation in 1999. After conversion, vehicle accidents increased from 75.9 to 164 (+116%). Pedestrian accidents increased from 5.9 to 12 (+103%). Volume of traffic increased from 30,900 to 35,600 (+15.2%) and the average speed decreased from 18.0 to 12.4 (-31.1%). ALBEQUERQUE, NM (1999-2003): Albequerque converted most of their downtown one-way streets to two-way streets between 1999-2003 (62 blocks total). After conversion, vehicle accidents increased from 778 to 824 (+5.9%). Pedestrian accidents increased from 14 to 26 (+85.7%). Bicycle accidents increased from 5 to 12 (+148%). Volume of traffic decreased from 359,430 to 284,180 (-20.9%). Sources: City of Denver, One-Way Street Monitoring Study, Phase 1 Conversion Report, January 1990. City of Cincinnati, Over-the-Rhine/Vine Street Circulation Study, February 2003. NYC DOT, The New York City Pedestrian Safety Study and Action Plan, August 2010. From the study "Children who spend time downtown therefore are exposed to more multi-laned one-way street thoroughfares. Also, poorer kids are more likely to walk to school and play on the streets and so they are exposed to more street crossings and vehicles. Finally there is higher volume of traffic on one-way streets in Hamilton (documented as a 10 to 50% increase after the change), a variable associated with up to a 13-fold increase in injury risk...Unfortunately, our inability to adjust for many of these variables limits our ability to isolate the responsible factor which increases the risk on Hamilton's one-way streets." I have a theory. We have live lanes of traffic inches away from narrow sidewalks. If a child, senior or an inebriated person falls down or stumbles off the curb, they're in live traffic. I often see folks use the outside lanes as passing lanes, I expect because they're used to passing on the right. This is the issue with our streets, how close pedestrians are to live traffic. If council converts Main to two way, we're going to get something that looks like Guelph line, or Upper James with two lanes and a centre turning lane. We're going to be even worse off. It's much cheaper, easier and faster to protect the sidewalk on our current one way streets with protected bike lanes and 24 hour street parking, and still have the flexibility for future growth. Hopefully, Cannon will be a model for future bike lanes. That being said, I'm not against two way conversions. I'm ok with all of the current planned conversions, and think Wentworth and North Wellington should be moved ahead. I'd also like to see my local streets converted to one way with bike lanes, trees and 24 hour parking, simply because they're two narrow to function as two way, but too wide for one way. For what ever reason, these conversations seem to always end up including every street and focusing on King and Main Downtown. Not to mention the link is only related to injuries, not deaths. Next time, please answer the question, it'd be appreciated. According to the New York City Pedestrian Safety Study and Action Plan, major two-way streets account for 47% of pedestrian fatalities in Manhattan but only make up 12% of the road network. Those numbers are useless without context. What percentage of the fatalities occurred on all major streets, and what portion of the road network do those streets represent? Do major two-way and one-way streets have the same density of pedestrian activity? Which is to say that most of the arterial streets are two-way, not one-way. So it's no surprise that 78% of the fatalities occurred on the 80% of the major arteries which are two-way, no? Oh because that makes it better! We should only care about how disgustingly unsafe our roads are only if children are actually dying. Sorry to have inserted death but that usually is the most serious issue. Pedestrians are involved in between 200-260 accidents a year in Hamilton. I would guess that a large number of these would be adults. Of those incidents, 40-60 result in serious injuries. Divide that by age, then figure out what number occurred on non arterial one way streets and then ask what number were "caused" by one way streets and you will end up with a miniscule number. The point being that you lose power in your arguments to eliminate one why streets by using the Lovejoy approach. I would stick with the "its better for business" approach because money talks. Oh good, now the concern troll is advising us on how to make the case for something he opposes. I found this elsewhere in the blog. Maybe Ballsup can comment. Good points. A study of traffic statistics in Hamilton from 1978-1994 concluded a child was 2.5 times more likely to be hit by a car on a one-way street. Of course, those numbers are useless without context. What percentage of the fatalities occurred on all major streets, and what portion of the road network do those streets represent? Do major two-way and one-way streets have the same density of pedestrian activity? Anybody can cherry pick a vague study that supports their view. However, I also cited a very specific before/after analysis of Park Avenue Tunnel and 33rd Street. When the tunnel had two-way flow, the intersection was one of the most dangerous intersections in the city, averaging 12 pedestrian crashes per year. After the conversion to one-way, the pedestrian accidents dropped to zero, and total injury accidents dropped by 74%. NYC fully understands the safety benefits of one-way streets. One-way streets are safer for pedestrians. Every before/after safety analysis that I've read on this topic would support that claim. I challenge you to find a before/after safety analysis that concludes two-way streets are actually safer for pedestrians. Sorry to keep posting on the troll issue, but how is that a concern troll. I see it as almost sarcasm. As in, "I don't agree with you but if I were you I would say ...." I see nothing in Charlesball's posts that suggests fake support just as in when he claimed Redmikes' only comment was a troll comment. Some people here are pretty quick to label people trolls. Maybe if Ballsup had the ... he could address the more salient point of the post as in how a minimal statistical figure leads to a significant financial and practical change. Ok ballsup - away you go. great observations. I've written about this before in reference to Portland and Montreal. Fantastic, complete one-way streets in those cities. One way streets don't have to be horrible, but we do them 100% wrong because we're addicted to high speed traffic. One of the great benefits of two-way King however is ease of access for west end/Dundas customers heading downtown. Shop-keepers brought this up decades ago when the conversion first happened. All of the customer base west of the core is now whisked past the core on Main and can't come east on King to shop. One only needs to look at King/Queen/College in TO to see how versatile and excellent retail streets like this function as two-way with slower traffic and curb parking. If they can do it with their millions of people, surely we can. - jason sez: "great observations. I've written about this before in reference to Portland and Montreal. Fantastic, complete one-way streets in those cities." -- We get it. You love Portland. You're free to move back any time. You seem to want us to be followers, not leaders. - jason sez: "Our problems are absolutely the timed lights and crazy restrictions at city hall on sidewalk patios. I suspect that wonderful neighbourhood in France sees a lot more consistent traffic than King in the IV, making it easier to keep traffic slow. I've always felt the International Village, and King West where you ate yesterday could be like this:"
--I thought the problem was one-ways and all the lanes? Now it's the timed lights and inability to impede the sidewalks? - jason sez: "Plants tons of large street trees, and get rid of the metal grates that keep them small and withered. Deprogram the lights and encourage (not restrict) businesses from bringing patios right to the sidewalk edge along with other displays, bike racks etc....."
-- Now the problem is metal grates? Maybe it's the abuse the trees get from passers-by, and/or lack of care from city arborists? Again, the issue isn't synchronized lights or lack of patio space. - jason sez: "One way streets don't have to be horrible, but we do them 100% wrong because we're addicted to high speed traffic." -- I thought they were horrible which is why you want them converted? Now it's that they move too quickly? Make up your mind, man! - jason sez: "One of the great benefits of two-way King however is ease of access for west end/Dundas customers heading downtown. Shop-keepers brought this up decades ago when the conversion first happened. All of the customer base west of the core is now whisked past the core on Main and can't come east on King to shop." -- Are there a lot of people heading from the west end and Dundas coming downtown? My family is from the west end and haven't been downtown in years. A number of friends also live in Dundas, and they don't come downtown unless they're visiting me. Their families don't come downtown. Who is coming from the suburbs to visit the core? - jason sez: "One only needs to look at King/Queen/College in TO to see how versatile and excellent retail streets like this function as two-way with slower traffic and curb parking. If they can do it with their millions of people, surely we can." -- Again, let's be followers, not leaders. I've been to those streets, and recently, too. There's lots of traffic zipping around, including streetcars. What's your point? Millions of people don't live on those streets, and those in your "millions" don't visit those streets daily, weekly, or even monthly. A coworker lives right downtown on College st. She doesn't visit any of these shops as they don't carry clothing, food, or items she'd purchase. Is she the minority? So we're somehow leaders because we have freeways running through our urban centre? Please go back to your troll-hole. Just had my first experience traveling downtown on King. I live in Westdale and rarely travel downtown past John Street. Had to go to the Catholic Children's Aid Society today. Two right lanes empty from John to Bay. South (left) lane on King full of buses from John to the Convention Centre effectively reducing the traffic for cars on King to one lane. Will not do that again. "Traditional transport models assume traffic volumes must flow through the transport network like water through pipes. But in many urban situations, traffic flows are more like a gas - they expand or retract to fill the available space." "It took me 25 minutes to get from Wellington and King to Dundurn and King" dont believe you. I can believe it. Try going downtown in rush hour sometime! I have had to go through the core a lot lately thanks to the KEnilworth access being closed, and it's a nightmare. So, maybe this is just due to the closed mountain access, but it certainly hasn't made me think that I should stop and run into a store to shop, eat, etc. Hey red mike, you Irish, Nordic or just a commie? Sorry, shouldn't bait the troll. One post a troll does not make. You're driving through the centre of downtown to go somewhere. Name any successful city anywhere where you do that. Where you take a shortcut through the centre of town. Anyhow, next time take Cannon for westbound traffic. Well traditionally speaking, "Main Street" has always been the main street through town. I mean King Street is Highway 8. But as it was pointed out, this trip was from Sanford to Dundurn, not really through town. Will do, for sure. And I don't lie. The patio idea is great, and these are great examples of one way streets. I think when LRT arrives, we should just block it off to car traffic and make it a pedestrian/bike/LRT mall. I think the slower traffic has already made the IV a gateway to downtown and really breaks the 20 minutes across the city mold. It often takes me 20 minutes to get from Victoria to James alone, so already it's not for through traffic. Through traffic can bypass north on Cannon, South along Hunter and King will open up again at James and then Bay. The best part about shoppers coming East from West/Dundas is the parking that's easily accessible from Main Street. Main and King are only a block apart, as is King William (which is due to become two way). One of the "two way is better for retail" arguments stems from the expectation that folks will "cruise" the strip at slow enough speed to look in the windows and that they'll be able to access the stores easily. I think in these days of GPS folks know where they're going, so it's really convenient to drive down Main, park in a lot off of Main and walk the downtown. King and Main don't have to be two way in the core because they're so close.